By Hal Pawson, UNSW and Cameron Parsell, The University of Queensland. This article was originally published on The Conversation. Read the original article. Exactly a decade ago in 2008, the Australian government committed to an ambitious strategy to halve national homelessness by 2020. Through stepped-up early intervention, better homelessness services and an expanded supply of affordable housing, the problem would be tackled with conviction. Instead, as succeeding governments regrettably abandoned the 2008 strategy, homelessness in Australia has been on the rise. Last week’s federal budget offered no response to this concern. And the problem is fast getting worse, as highlighted in our new Australian Homelessness Monitor, prepared for independent community organisation Launch Housing. 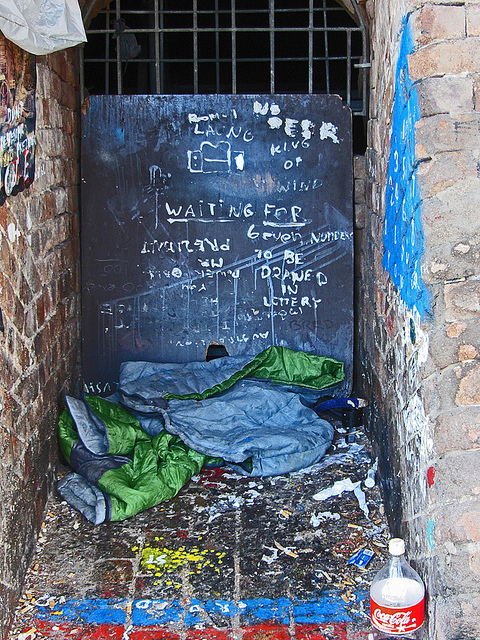 Emulating a respected UK annual monitoring project, this report is a comprehensive national analysis of the state of homelessness in Australia together with the potential policy, economic and social drivers of the trends across the country. Recently published 2016 Census statistics showed a 14% increase in overall homelessness in Australia since 2011. That’s well ahead of the nation’s population growth rate. Our major cities have seen much larger rises in homelessness. Recent increases have been especially big in Sydney (up 48% since 2011), Darwin (up 36%) and Brisbane (up 32%). Concerningly, the numbers of people sleeping rough have been growing particularly fast. This, the most visible and extreme form of homelessness, grew nationally by 20% over the 2011-2016 period. Although offset by periodic rehousing initiatives for long-term street homeless, five-year increases in the municipalities of Sydney, Melbourne and Adelaide have exceeded the national trend. This was especially true in Melbourne. The 2016 City of Melbourne count showed numbers jumped by more than 200% over this period. Why are the numbers soaring? criminal justice policies that are increasing the prison population, which leads to a rising rate of prison discharge – a moment when the risk of homelessness is high. Such developments are critical in a housing market where, by international standards, subsidised social housing provision is minimal. This means the vast majority of Australia’s lower-income population must depend on an increasingly stressed private rental sector in which the stock of low-cost homes is dwindling. Partly as a result, ABS statistics cited in our report show the proportion of low-income tenants in rental stress has risen from 35% to 44% over the past decade nationally. In New South Wales, it has risen from 43% to 51%. In Victoria, the figure rose from 32% to 47% over the decade. The geographical pattern of recent homeless changes shows the housing market is driving these changes. Our report finds increases in homelessness have generally been much more rapid in capital cities. Non-metropolitan areas have recorded much lower growth rates, or even reductions. In another pointer to housing market impacts, increases in homelessness have tended to be higher in the large eastern states. These are the states where economies and property markets have been relatively strong over the past few years. In South Australia, Tasmania and Western Australia, where these factors have been less evident, the rate of homeless growth has been lower. So, overall numbers were up by 53% in inner Sydney (2011-2016), but rose by a more modest 21% in Hobart. In contrast, homeless numbers fell by over 30% in remote South Australia and Western Australia. Despite these stark trends, recent Australian governments, while footing the bill for homelessness services rising well ahead of inflation, have presided over cuts in social and affordable housing. In its 2014 budget, the Abbott government cancelled the National Rental Affordability Scheme. This was Australia’s last national affordable housing construction program. An increasingly underfunded social and affordable housing system leads to a burgeoning homelessness support system. The cost of emergency services for those lacking homes has risen by 29% in real terms over the past four years. On its current path, the cost is set to exceed A$1 billion by 2020. Meanwhile, in the face of deteriorating public housing stock and intensifying shortage, social housing investment by state and territory governments has actually fallen by 7% since 2012-13. Five years ago, prior to the 2013 federal election, then opposition spokeswoman on housing Marise Payne said “the Coalition’s homelessness plan” was “to abolish the carbon tax, pay down Labor’s debt, generate one million jobs in the next five years and increase our collective wealth so all of us – individuals and charities – have the capacity to help the homeless and those most in need in areas where government is not always the answer”. While placing faith in philanthropy, such sentiment is underpinned by a stubborn belief that we can rely on market forces to provide suitable and affordable housing for disadvantaged Australians – just as much as for all other citizens. It is clear from the latest statistics that the official approach moulded by this thinking has failed. Looking to the future, the ongoing restructuring of private rental markets seems likely to keep pushing up the numbers of people subject to housing insecurity. The availability of affordable low-rent housing continues to contract. For any realistic chance of progress, the Australian government needs to reconfirm recognition of homelessness as a social ill that must not be ignored. It needs to re-engage with the problem, starting with a coherent strategic vision to reduce the scale of homelessness by a measurable amount within a defined period. And it needs to recommit to a level of government support that ensures enough social and affordable housing is provided to keep pace with growing need, at the very least. Disappointingly, the federal budget provided no indication that such developments are in prospect. Yet squarely tackling Australia’s growing homelessness problem demands recognition that excluding people from safe, secure and affordable housing is effectively a denial of citizenship.